The Society has submitted a Stage 1 grant application for $1,200 to the Union Pacific Foundation for funding of replacement panes for CP 29's clearstory windows. The Foundation notified us that they may be interested in funding our project, and we were invited to submit a more detailed application for Stage 2 of their funding process. By the time you read this we will have submitted the second application. We may also have received the "Yes" or "No" from the U.P. Foundation. The requested funds would cover most of the acquisition cost of 20 new panes for the clearstory roof. These would be tempered glass decorated with the oval-and-stars pattern on the original panes. Three of the 18 panes are missing, and a fourth is broken. Eighteen of the new panes would go into new or refurbished sash, while the last two would be kept as spares. The quoted price is $60 apiece, so the 20 panes would cost us $1,200. Sales tax at 9 percent adds $108 to the total price. If the new panes are funded by the grant we will have them made and then store them in the Archives until one of our woodworkers can make new frames. If our application is denied, then the new panes can wait until the restoration is further along. Society member Lou Bradas donated several NWP items to the Hogarty Library. In addition to the number plate for 0-6-0 switcher 229 (ALCO, 1914) and the builder's plate for Ten-Wheeler 142 (Baldwin, 1922), and numerous paper items, Lou donated a basket rack from an NWP coach. The rack is illustrated in the 1913 Car Builders Dictionary. It is a Rex Wire Cord Basket Rack with a removable bottom, sold by the Dayton Manufacturing Company. The company is still in business. Although the donated rack is of the right vintage to have been installed in our car, it probably wasn't. When CP 29 and the other five coaches were sold to the NWP and refurbished in 1912, they each received 14 new basket racks. With only seven racks along each side wall above the windows, the racks would need to be double length to provide adequate overhead storage. 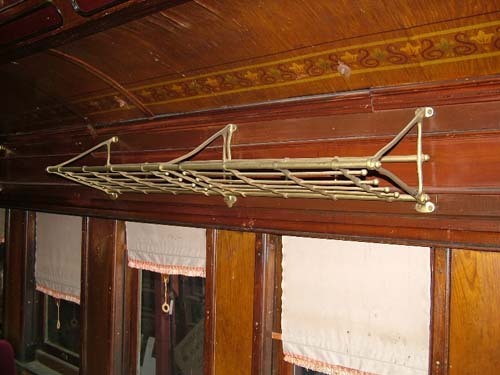 Gus Campagna's photo of a basket rack in Sierra RR coach 2 (ex-CP 43) shows a rack that probably is similar to the racks installed by the NWP shop crew. A suitable rack may be available from Adams & Westlake (Adlake), another old time railroad supply company that is still in business. The California State Railroad Museum Archive still has valuable data for the Society's projects. We just located a 1903 drawing of the pedestal needed for CP 29's trucks. Having this drawing in our collection means that we will not have to make a pattern that is based on some photos. Instead we can give a pattern maker the CSRM drawing, which has all the information needed to create the casting patterns. The result will be a truly authentic set of eight pedestals for CP 29's trucks. Photo 1: CP 29 needs 14 basket racks like this one in sister car Sierra 2. Photo by Gus Campagna. Photo 2: Plans for this pedestal have turned up at CSRM, so we won't have to reverse-engineer a design drawing. Photo by Roger Graeber. As reported in the last Headlight, the Society submitted a more-detailed Stage 2 grant application to the Union Pacific Foundation for funding of replacement panes for CP 29's clearstory windows. Unfortunately we will have to wait until February for the Foundation's decision. Jeff Millerick and Frank Moraes have been doing the final cutting and shaping of the ends of the oak timbers for the trucks. Dave Dietz and Kevin Cunningham have been chiseling out the mortise holes. After a few more work sessions the timbers will be ready for painting and assembly. 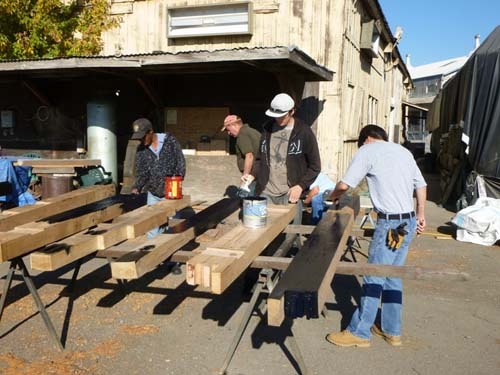 Although the Board of Directors decided last fall to set the restoration of CP 29 aside for the time being, we have been gaining Restoration Team members and they need work projects. Disassembly of the interior of CP 29 has been started. 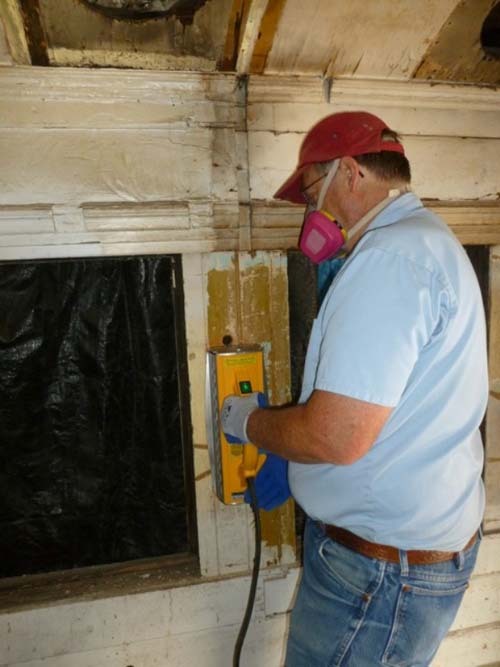 The author used our Speed Heater infrared heat lamp to remove some of the paint from one wall. 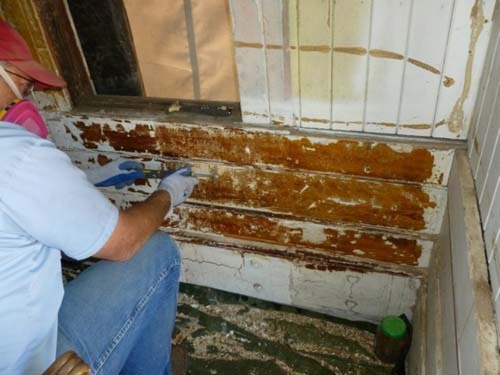 The old paint is heated enough to soften it for scraping but not enough to vaporize any lead that may be contained in the paint. Where the original paint had been applied directly to wood, the paint came off in long strips. Paint applied over varnish came loose in small chips. Either way, the paint came off faster with the lamp than with liquid paint remover. Too bad we did not have the lamp when we were scraping paint off of Caboose 1. Dave Dietz removed the few remaining brass window latches and lift handles. Only seven latches and four lift handles remained of the 30 latches and 30 lifts fitted to the windows by the CP and NWP shop crews. At some point in time the recessed roller shade and head jamb was removed from each of the windows. Plywood boards were installed to fill the openings. Steve Atnip and one of our new student members, Jelani Hall, removed the boards. When the interior is restored we will replace the shades and install solid boards of the correct profile. 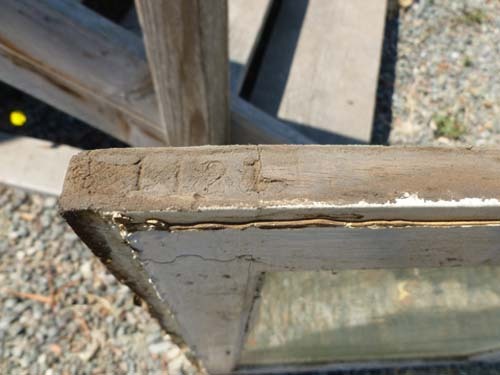 When we removed the first window's sash and jamb components for examination, we were surprised to find two car numbers - 1121 and 123 - stamped into the upper sash rail. These numbers were barely noticeable due to their being completely packed with dust. Steve Atnip found the number '29' stamped into the reverse side of the left window jamb, which is one of the vertical boards forming the sides of the window frame. We found the number '30' stamped into the right jamb, and also into the upper rail. It appears that the window and hardware components were assembled in sets, and numbered to keep the individually fitted components together. The left and right side jambs are mirror images of each other, identical except for the roller shade end brackets and the bottom cut that allowed the boards to fit over the upper face of the sill. Both boards had the '1121' and '123' stamped on their reverse sides. The '1121' shows CP 29 had been renumbered before the car was fitted with the windows. The second number - 123 - shows the window components were removed and then replaced by NWP employees. This may have occurred in 1912 when the car was purchased from the Central Pacific and prepared for mainline service. Photo 1: Jeff Millerick contemplates all the cutting and notching required for the oak timbers. All photos by Steve Atnip unless otherwise credited. Photo 2: Maintenance-of-Way paint is being removed from the tongue and groove boards between windows. This area became the Ladies Salon in 1917 or 1918. The vertical notch was cut in to anchor the new wall in position. Photo 3: When it is properly heated the paint applied directly onto wood comes off in long strips. Photo 4: CP 29's Wason factory varnish sees the light of day for the first time in more than 70 years. Paint on varnish comes off in small chips. Photo 5: Jelani Hall, one of the Society's newest members, removes a plywood head jamb board. Photo by the author. Photo 6: CP 29's second number - 1121 - and its first NWP number - 123 - are stamped into the top of each window sash and into the reverse side of each window jamb. Photo 7: All window sash and jambs are being removed as part of the restoration of CP 29. 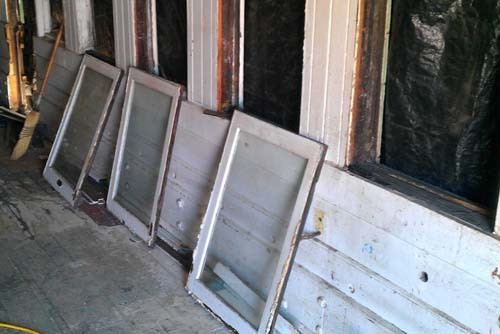 Each window sash will be stripped of paint and evaluated, then repaired and reused if feasible. The missing or severely damaged windows will be replaced. Photo by the author. We have spent several months working on the truck frames. The oak timbers require a lot of sawing, drilling and chiseling before they will fit together properly. 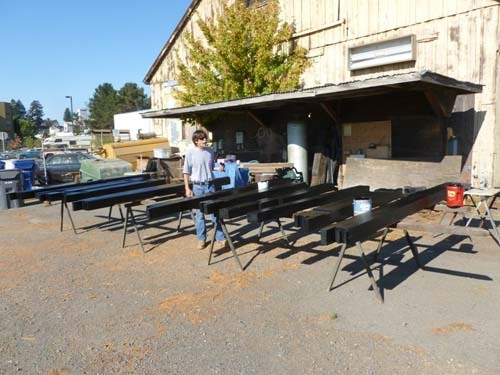 By the time you read this, the Preservation Team will have completed the shaping and painting, and hopefully will have permanently assembled the truck frames. The frames will be stored inside the De Carli Trolley Museum barn through the winter. Working with the seasoned oak required a mix of modern and classic hand tools. Electric saws and drills, and even a grinding disc, were used when feasible to quickly remove excess wood. But chisels of various sizes are required to form mortises, and these are powered with a vigorous application of hammer or mallet. 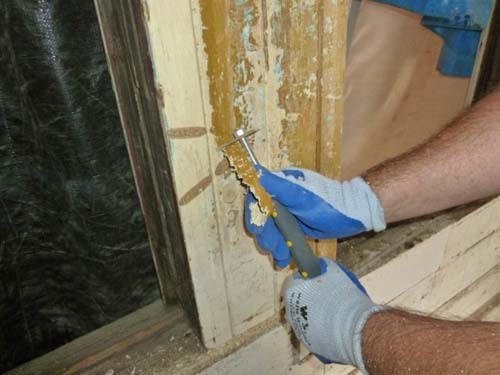 A timber framer's slick (a two-handed smoothing chisel) was used by Jeff Millerick to complete the work in some areas. All of the castings from B&O 20 that we will reuse have been sand blasted and painted, and are ready to go. We still need a set of pedestals, so a pattern must be created and eight pieces cast. The costs are estimated at $4,600 for creating drawings and making the pattern, and $4,200 for casting the pedestals. Hopefully we will have a set of castings on the trucks by the end of the 2014 work season. Photo 1: The author and Jeff Millerick test-fit the front end-piece onto the truck frame's wheel pieces (side beams). The stepped pyramid shape of the front end-piece with a gap in the bottom will allow a movable steel rod to control the truck's brake assembly without reducing the strength of the wood. This photo by Steve Atnip; all others by the author. Photo 2: The first truck frame is assembled but upside down. 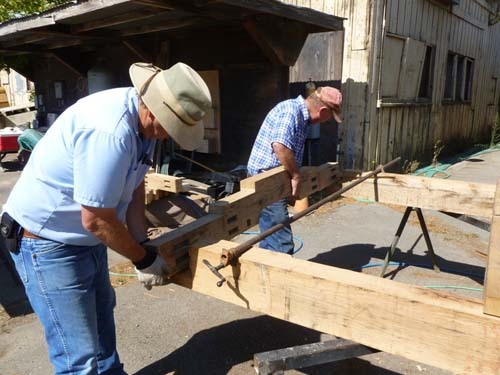 The mortises in the front and back end-pieces and transoms (center) will hold the tenons of the axle guards or safety beams, which are designed to help support a broken axle. Photo 3: Dave Dietz looks on while Jeff Millerick and Richard Fries lay out grooves on the sides of the transoms. The grooves will be scored to the proper depth with a circular saw then chiseled to remove excess wood. Afterwards, support brackets known as spring plank hanger-carriers will be installed in the grooves. 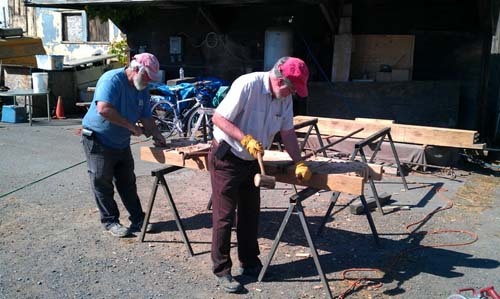 Photo 4: Steve Atnip and Dave Dietz chisel out the grooves for the spring plank hanger-carriers. Precutting the grooves with the circular saw makes the chiseling much easier. 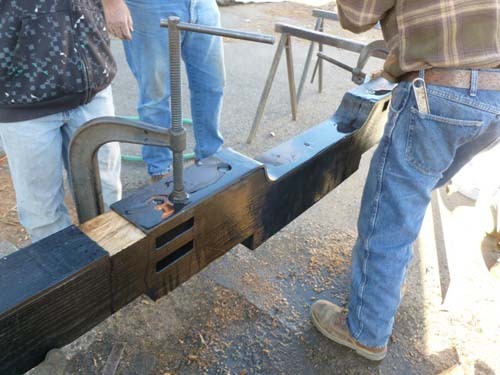 Our Restoration Team members began the 2013 work season by disassembling the leaf springs from B&O 20 in preparation for sand blasting, and beginning the layout work for cutting and routing the oak timbers to be used for the truck frames. Work progressed throughout the year. The springs, castings and many of the fasteners have been repaired as needed, sandblasted and painted, and are ready for installation. 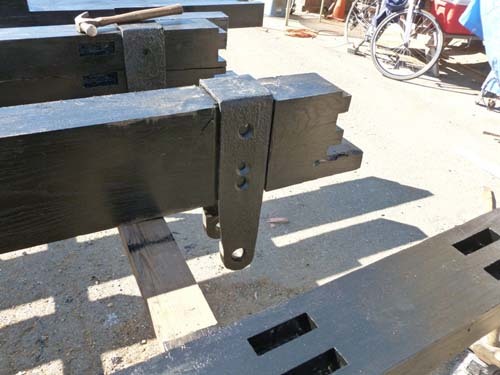 The timbers have been cut, routed and chiseled as necessary to form the required mortises, tenons and grooves, test-fitted, then painted black. 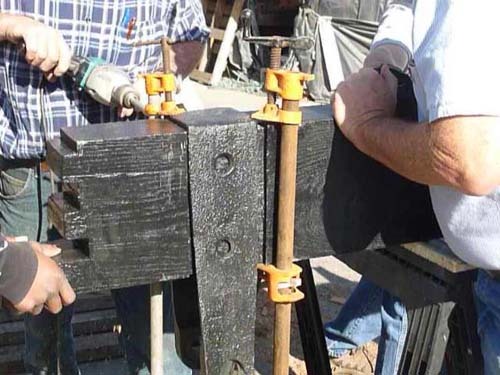 At our November work sessions, some of the refurbished castings were fastened into position on their timbers. In his metal-working shop Jeff Millerick welded the broken equalizer bar. He also heated and straightened all four of the equalizer bars. These had been curved by the B&O shop crew to make use of short coil spring sets. When our trucks are reassembled they will be fitted with coil spring sets of the correct length. In late June we started to disassemble the interior of CP 29. 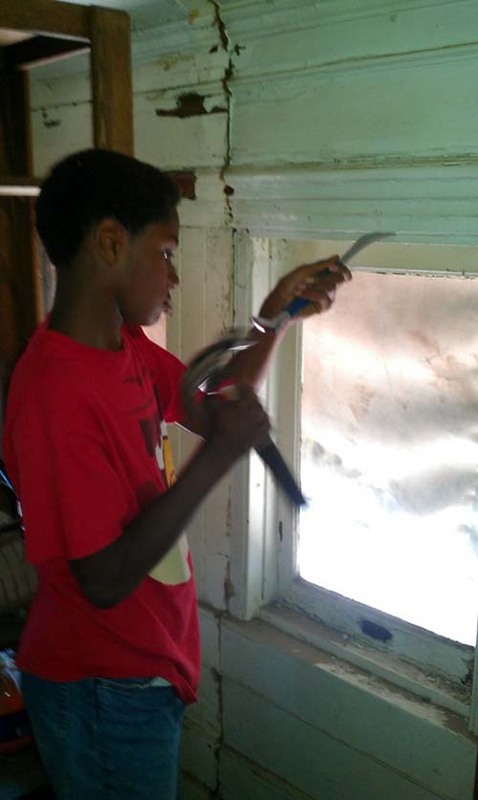 The work included removal of window sashes, and pulling up sheet metal plates that were nailed over holes in the floor boards. When we removed some of the window sashes and jambs we found two car numbers - 1121 and 123 - stamped into the upper sash rails as well as into the reverse sides of the jambs. The '1121' shows CP 29 had been renumbered by the Central Pacific before the car was fitted with the windows. The second number - 123 - shows the window components were removed and then reinstalled by NWP employees. The later numbering may have occurred in 1912 when the car was purchased and prepared for NWP's mainline service. 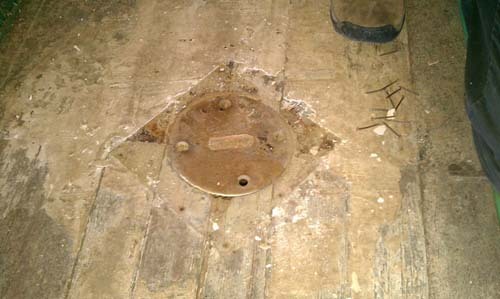 Removal of the sheet metal over the king pin holes revealed a generic 6" round brass cover plate set into position above each hole. The recessed central area of each plate had contained numbers and perhaps letters but these had been chiseled out. Kyle Wyatt of the California State Railroad Museum provided a photo of an identical cover plate from Sierra Railroad coach 1 (formerly CP 1160, built 1869). That plate had what appears to be a pattern number in the recessed area. The same car had a second cover plate (now missing) reportedly embossed with "CENTRAL PACIFIC" around the circumference and "1892" in the center. This second style of plate may date from when the car was rebuilt with new siding, windows and roof ends in the 1890's. The "1892" may be the date of casting or more likely is the pattern number. A search of the online catalog of technical drawings in the Central Pacific collection at CSRM revealed that drawings of patterns with these two numbers are not in the collection, but they would date from the early 1870's. This spring the Society's collection of artifacts yielded a genuine Wason king pin cover plate. A tag on the reverse side states the plate came from an NWP interurban car. Based on our roster data, the plate had been fastened to the floor of one of six coaches built for the San Francisco & North Pacific Railroad in 1884 and 1885. These cars were converted into electric trailers for use with the Marin County commuter trains. The round plate is cast in brass and painted with red enamel, well-worn but still serviceable. When the time comes, we will have to choose the style of plate to use in CP 29: Wason, Central Pacific or generic. The Society submitted a Stage 1 grant application for $1,200 to the Union Pacific Foundation for funding of replacement panes for CP 29's clearstory windows. The Foundation notified us that they may be interested in funding our project, and we submitted a more detailed application for Stage 2 of their funding process. Unfortunately we will have to wait until February for the Foundation's decision. The California State Railroad Museum Archive provided a 1903 drawing of the pedestal needed for CP 29's trucks. In 2014 we intend to order a pattern based on the CSRM drawing, which has all the information needed to create a truly authentic set of eight pedestals for CP 29's trucks. The pattern and castings will be ordered as funds become available. The costs are estimated at $4,600 for creating drawings and making the pattern, and $4,200 for casting the pedestals. 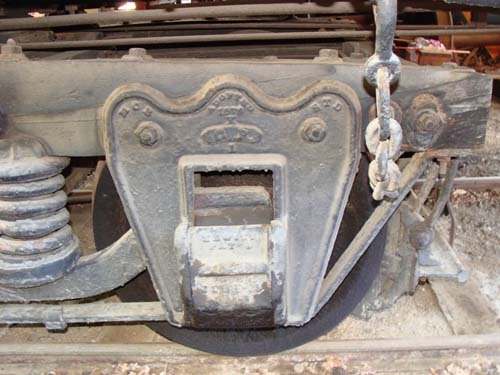 CP 29 had a pair of brass king pin cover plates hidden beneath sheet metal patch plates. Numbers, or possibly letters, in the recessed center area have been chiseled out. These may have been removed by an NWP shop worker. This photo is by the author; all others are by Steve Atnip. 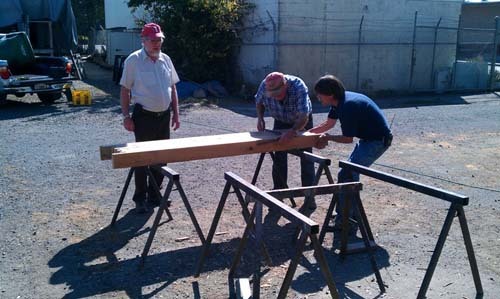 In our last October work session Jelani Hall, Dimitri Kosdrosky and Richard Fries began painting the truck timbers. 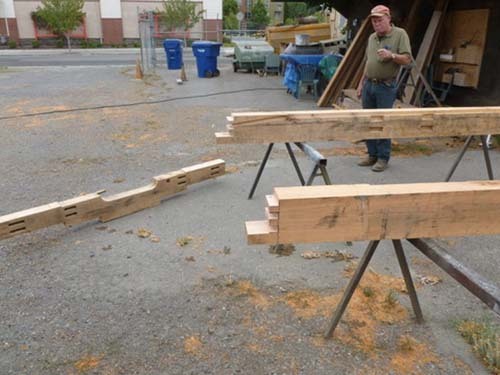 In the background, Jeff Millerick selects the next timbers to be painted. Richard Fries looks over the day's work. All timbers are black, which is prototypical for Central Pacific and Northwestern Pacific cars of this era. The metal brackets are spring-plank hanger-carriers. 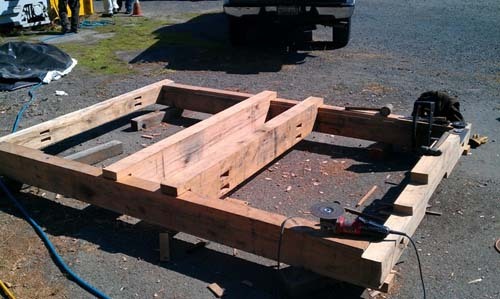 There will be one at each end of a transom, and two transoms within each truck frame on either side of the spring plank. 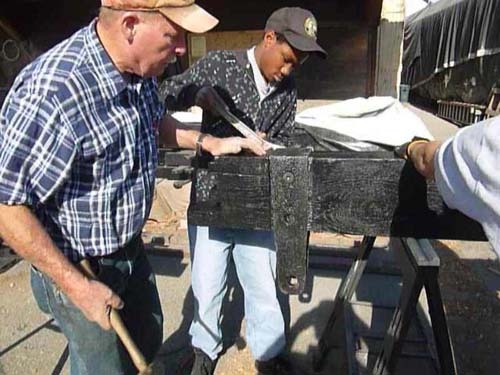 The tenons of the transoms fit into the mortises of the wheel piece in the foreground. November arrives, and it is time to assemble some components. Jeff Millerick begins drilling bolt holes for mounting the spring-plank hanger-carrier to the transom. All technical terms are defined in the 1895 Car Builders Dictionary, which is available for downloading at https://archive.org/details/cu31924032183513. Jelani Hall tightens the nut on the first 3/4-inch bolt. Two are needed for each hanger-carrier. An end-piece plate is clamped into position to reinforce and protect the front end-piece. Four bolts will hold it in place. The recessed area is on the end of the truck that faces the center of the car. It allows passage of the upper brake-lever connecting rod into the truck interior, where the rod attaches to the live truck-lever to actuate the brake beams.